Tinde is certainly not of those vegetables which lie in everyone’s good book! My husband and my sunny boy pinch their nose every time they eat Tinde. They come up with all sort of excuses to not eat the vegetable and even if I insist them to eat, they barely eat a small portion. On my recent trip to the vegetable store, I could not resist buying these small, evenly sized tender Tinde and prepared Shahi Bharwan Tinde. 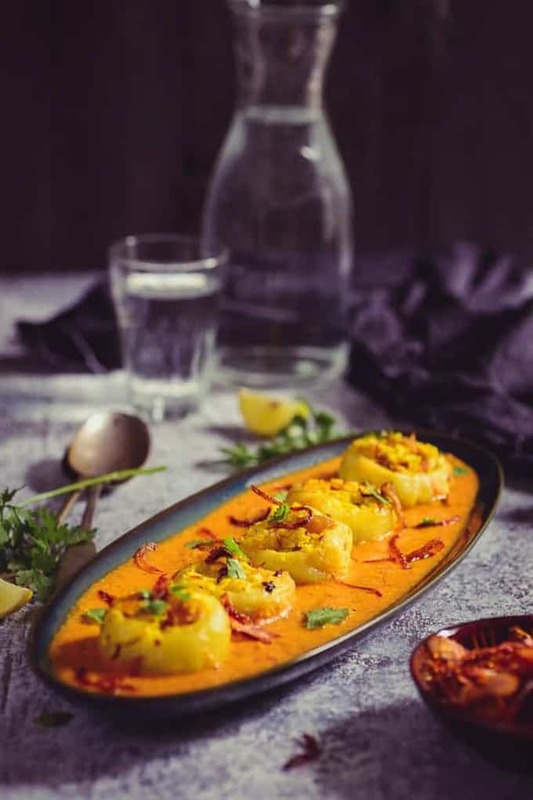 The aroma and the taste of Shahi Bharwan Tinde was so inviting that both the men in my house were compelled to take another serving and that too without my persistence. 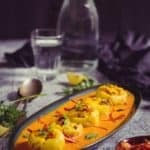 Shahi Bharwan Tinde is also a very good option to make when you have guests at home and you want to try out something other than a paneer dish. Someday, when you are actually craving for a typical homely meal,Shahi Bharwan Tinde and piping hot Laccha Parathas would not disappoint you for sure! Shahi Bharwan Tinde has such a rich and luscious gravy that one cannot help but fall for it every time one relishes it! BTW, Shahi Bharwan Tinde tastes yummy even with Zeera Rice. 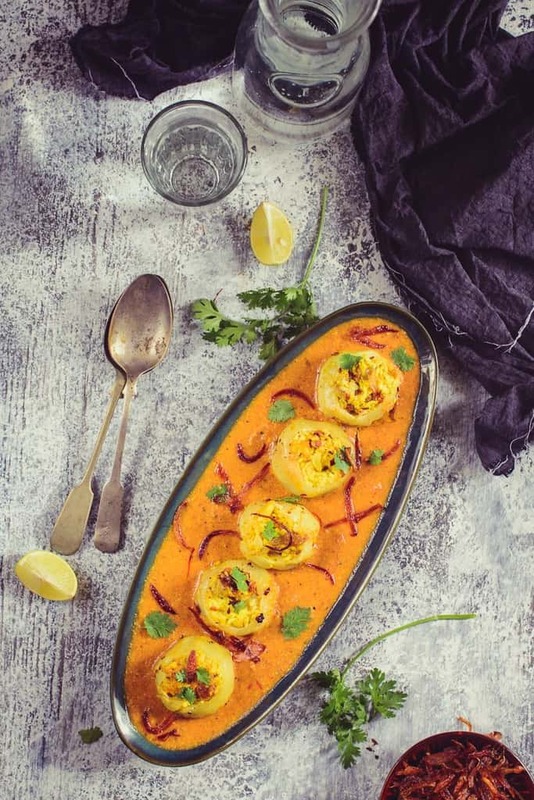 Do prepare Shahi Bharwan Tinde and try interesting meal combinations along with it! Using a knife, remove the center pith of the tinde keeping the sides intact. You basically have to make a bowl of Tinda. Prepare all the tinde in the same manner. When the oil is hot, add cumin seeds and heeng. Once the cumin seeds starts to crackle, add grated panner, the pith from tinde, salt, turmeric powder, dry mango powder, raisins and cashew nuts and fry for 2-3 minutes. Remove the pan from heat and let the filling cool. Fill this filling inside the Tinde tightly. Add remaining 2 tbsp oil in the same pan. Arrange the tinde in a single layer in the pan. Add 1/2 cup of water and cover and cook tinde on low heat till they are softened. Open the cover and cook on high heat till all the water is absorbed and tinde are slightly browned. Transfer the tinde in a plate and keep aside. Add cloves, cardamom and cinnamon and fry for a few seconds. Add onion and fry till it turns translucent. Add tomato, ginger and garlic and fry for another minute. Remove from heat and let the masala cool. Grind the masala in a blender along with almonds and cashew nuts to make a smooth paste. Add ghee in the same pan. Add the ground masala, tomato puree, kashmiri red chili powder, turmeric powder, coriander powder, salt and garam masala and fry for 2-3 minutes. Add lemon juice, saffron soaked in milk, sugar and fresh cream and cook for a minute. 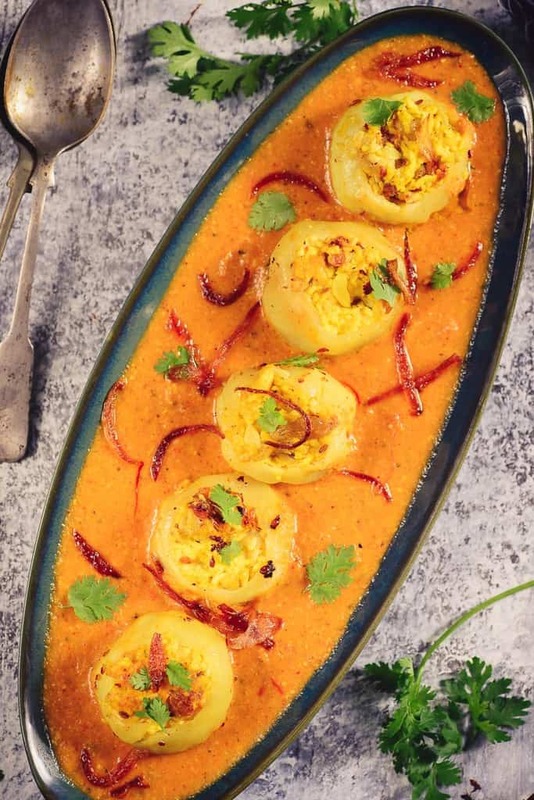 To serve, arrange Stuffed Tinde in a plate. Pour the curry on top. Garnish with fresh coriander and dry fruit slivers or Golden Fried Onions. Serve hot with Laccha paratha or Naan. This looks terrific. I had to google tinde, though – not something readily available in my part of the world. what does it taste like? any ideas what I could substitute?